Pacific Northwest Peaks & Pours tour is a craft beer enthusiasts dream come true. The 8-day excursion winds its way from Seattle to Portland, Ashland and Bend, with behind-the-scenes tours and tastings as some of the countries most coveted breweries. Along the way we will experiences the iconic sites of the region and make sure you have plenty of down time to enjoy exploring on your own. DAY 1: This evening, mingle with other group members at a meet and greet reception hosted by our guide, a beer aficionado and destination specialist. DAY 2: Tour Seattle, visiting colorful neighborhoods and iconic attractions such as historic Pioneer Square, and the Space Needle. This afternoon is reserved for tastings. The city’s small-batch producers tend to know their stuff, producing solid line-ups of supremely drinkable IPAs, stouts and more. DAY 3: Members of the Pike Place Market community will guide us through the market ensuring we receive special treatment. Meet the Market’s lively characters and hear their memorable stories. Upon arrival in Portland, there’ll be time to relax, before meeting up for a special evening program. Use real ghost hunting equipment to visit known ghostly places and get behind the scenes to understand a true view into the reality of paranormal investigations. Day 4: Portland sits on the Columbia and Willamette rivers, in the shadow of snow-capped Mount Hood. We’ll enjoy an orientation tour of the city and its iconic gardens. This afternoon, explore more of the city on a bicycle tour that will take us to breweries a walking tour to some of the downtown area’s most unique restaurants, food emporiums and food trucks. 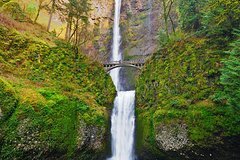 DAY 5: Visit Columbia River Gorge and experience the power and beauty of nature up close at Multnomah Falls, a 611-foot-tall roaring, awe-inspiring cascade of icy water. We’ll then stop at some of the 12 breweries in this area. DAY 6: Travel to Crater Lake National Park. Created by a collapsed volcano after a violent eruption more than 7,000 years ago, scientists marvel at its purity. Fed only by rain and snow, it’s the deepest lake in the US at nearly 2,000 feet. A National Park Ranger will talk to us about the Park’s origins and special features before we take a leisurely hike. Ranked in the top 10 of “The 100 Best Small Art Towns in America,” Ashland is a cultural hot spot, with award-winning galleries, theaters and restaurants. DAY 7: Tour the city of Eugene, home to the University of Oregon and a prominent arts community. After a short walking tour, we’ll stop in an area of Eugene aligned with local breweries, all part of Eugene’s Ale Trail. This evening arrive in the coastal community of Cannon Beach which combines the inspiring beauty of the Oregon Coast with a picture-perfect village by the sea. Day 8: Start the day with a walk on the beach to dramatic shoreline rock formations like Haystack Rock, one of Oregon’s most recognizable landmarks, rising 235 feet from the edge of the shoreline. Cannon Beach also offers the quintessential small beach town experience. Wander the picturesque sidewalks and courtyards of downtown Cannon Beach to discover art galleries, specialty shops and public art.